Goldman Sachs (GS) and JP Morgan (JPM), reported blow-out earnings to be matched with blow-out six and seven-figure bonuses for their staffs. 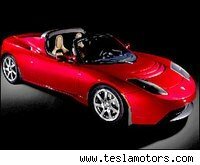 And struggling electric car company Tesla Motors opened a Gotham showroom (via AMNewYork) for its Roadster. This sporty two-seater zips from zero-to-sixty in a breathtaking 3.7 seconds. The car's $109,000 price tag is also breathtaking. But if you're a bulge-bracket banker, coughing up $109,000 for a car means merely a slight downgrade on the Hamptons summer rental. So the modest proposal is thus -- for all bankers getting bonuses over $500,000 -- to put their names on the Tesla waiting list and take the cash out of their bonuses. Such a plan would have numerous benefits. First and foremost, ownership of such a limited edition vehicle (only a few hundreds Tesla Roadsters have been produced to date) would enhance the self-esteem of the beleaguered Investment bankers by giving them a toy that their out-of-work hedge fund homies don't have (only 40 Roadsters have been delivered to New York City zip codes to date). The car might also be reward enough to assuage the bankers' nerves, frayed from repeated and angry questions about how these folks managed to take billions in taxpayer bailout monies and still end up with such fat bonuses while the real unemployment rate hovers around 16 percent. But with the Tesla bonus plan, these bankers are helping support a new American industry, providing for American jobs, and reducing U.S. dependence on foreign oil -- a nifty trifecta. Unbeknown to the bankers, the Tesla plan would reintroduce them to the concept of moral hazard. Unlike Goldman Sachs or JP Morgan, Tesla would be allowed to fail by the U.S. government. Ergo, the Tesla Plan forces the bankers and their brethren to put their own real capital at risk -- a novel concept these days. And if Tesla goes bust, well, sorry, peeps. Your bonuses went to a really good cause. For Tesla, this bonus queue would provide a guaranteed income stream that would benefit the taxpayers. It would make it far more likely that the citizens of the U.S. would actually get paid back the $400-plus million in government loans promised to an electric car company making six-figure sportsters. If even 5 percent of the $11.4 billion Goldman alone hope to pay out in bonuses for 2009 went to purchase Tesla vehicles, that would represent roughly $570 million in electric car stimulus monies, a tidy sum sufficient to snap up roughly 5,200 Roadsters. That would constitute a whopping ten-fold increase in sales. With this new stream of income rolling in, Tesla might be able to more quickly scale its operations and drive down the price of its cars in order to make them truly accessible to the hoi poloi. Goldman and JP Morgan people could honestly claim they had done their part for society and for the future of America. And the prospects for a viable electric car industry would be much improved. One last modest proposal though. Perhaps a small portion of the bonus pool could be directed to purchasing Priuses for the less well compensated bankers at institutions not deemed too big to fail such as CIT? No, that would be asking too much, wouldn't it?